I thought long about what to do for the 31 Days of Magic challenge today. I’ve been trying really hard to concentrate on things that I made. But while I’ve made my own robe, and the grade sashes for my membership in the DOGD, I didn’t really have the need to consecrate those. They’ve already been charged by using them, which Jason recommends in his Strategic Sorcery class anyway. Clothing, and cloth in general, is not a great material for magic. It wears out easily; stains and discoloration. Cotton, the “fabric of our lives” as the advertisements would have it, is not particularly susceptible to magical manipulation. In this challenge I was hoping to make everything myself, but I didn’t have that luxury today. I wound up being focused on other things, and planning an article of clothing — especially one which is intended to be magical — as a Maker activity is actually much more complicated than you might think. You need a pattern, you need to cut out the pattern parts, and then you need to assemble them. And then, quite honestly, you need to curse your own stupidity, disassemble the parts, and reassemble them correctly. And then you need to really curse and shout, because you’ve now assembled them the right-way-round… but out of order, and now other parts won’t fit together. Oops. So I didn’t do that. But a belt? A belt is something I wear every day. I have one of those waists that tends to spill out over my belt loops if I’m not paying attention to what I put in my mouth. 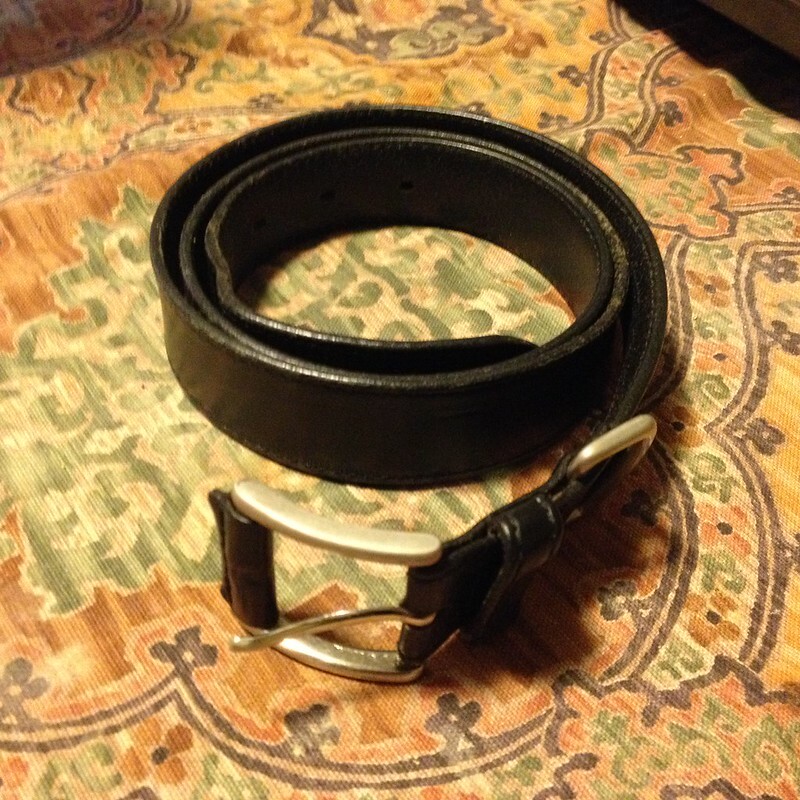 And I tend to wear my belt always on the two outermost holes. So I asked it to help me. I asked it to help me notice what I put in my mouth, and I asked it to help me get to a place, safely and carefully, where I could put it on the two innermost holes of my belt. Some of my readers may be thinking, “You’re talking to inanimate objects. You’ve gone off the deep end on this one.” But hear me out on this one — we all have lots of stuff, don’t we? And we all have a tendency to overeat. You can’t count on a person to help you not-overeat; they’re doing it too. You have to count on yourself. And on your belt. It’s going to be honest with you in a way that most people won’t ever be. So why not give it a name? Why not treat it as a caring partner in the relationship between you and your belly? I wear a tie pretty much every day. At this point, I wear a purple tie on Mondays in honor of the Moon, a red tie on Tuesdays in honor of Mars, an orange tie on Wednesday in honor of Mercury, a blue tie (this is one of several, actually), in honor of Jupiter on Thursdays, and a green one on Fridays in honor of Venus. Saturn rarely gets his black tie worn on Saturdays, nor the Sun on Sundays his yellow tie. But they’re part of the magic that I weave for myself on a daily basis. It’s about making magic part of who you are, rather than what you do. 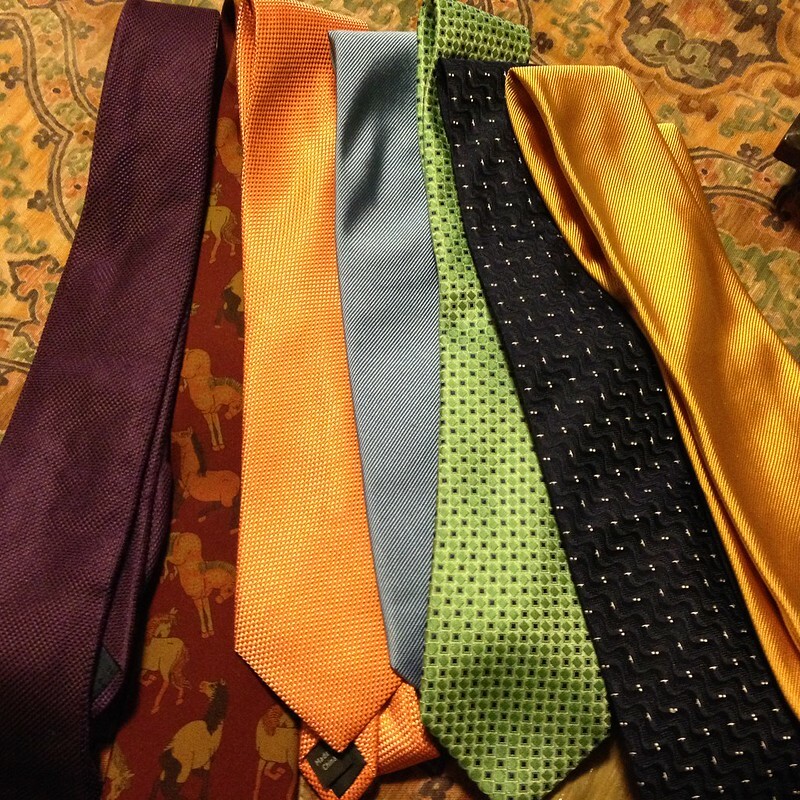 But more than wearing colored ties for the planets and their powers, I treat each of them as if it were a connection to a specific kind of power, a specific kind of awareness that I need as a Maker. The Moon, in traditional cosmology, is said to give finished shape and foundation to all things, and to weave individual beings into a state of interrelationship. This tie reminds me to help others, and to ask for help. Mars’s tie is there to help me remember to say no. I can’t do everything, and I shouldn’t try. The horses are there to remind me to run away if people are insistent, and to start kicking if they get too insistent. I don’t say no often enough … but Mars’s power is to help me keep focused on what matters to me. Mercury’s power is multivalenced: communication and knowledge and research and prototyping. He reminds me to go to the library, to look up what’s been done before, to ask questions, to draft something before I have to present the final project, to consult the prior knowledge of the human species — to go to the ancestors. Chances are, whether it’s about electricity or programming or chemistry or cooking, it’s somewhere in the archive, and I can learn how others have done it. Jupiter’s jovial power (for me) is visualization. Chances are pretty good that if I can draw it, I can build it. If I can imagine it, I can Make it. He reminds me to practice writing and drawing regularly, and to draw far more than I Make. Jupiter also reminds me to decide. I can’t get hung up on too many details, or have too many projects going at once. I have to select one, and move on with it, and come to some decisions about what I will do and how I’ll spend my time. Saturday’s tie is there to remind me (however infrequently I wear it) to set limits and boundaries on my work for other people. Sometimes time in for myself. This tie always seems a little too tight, a little too restrictive. But I’m almost always putting it on, for an occasion I don’t really want to do. This is a reminder that life is in part for me, and for my own Work in the world, and not just for other people. From a Maker’s perspective, it’s a reminder that I want to build and make things… and that means putting limits and boundaries on my life about what I will and won’t do. Sunday’s yellow-golden tie is a reminder that life is beautiful. It reminds me to ask the question “What next?” Sometimes it’s a new project. Sometimes its moving ahead on an old project. Sometimes it’s going to the hardware store or the art supply store or the metaphysics shop. Every project has steps, procedures, that must be fulfilled. Sunday reminds me to think through next steps, to plan ahead, to notice what needs doing before it needs to be done. And so my ties serve me, too. Every day I think about steps and courses of action, guided by color and by the leash around my neck… the noose I tie in place myself.